The selection of men's products in the green beauty world is nowhere near as extensive as what's out there for us ladies, but there are still a lot of great options. 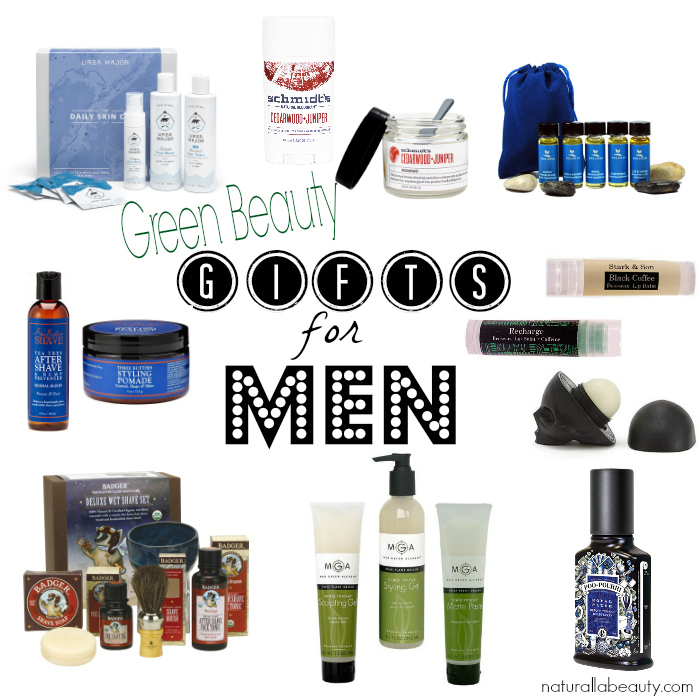 For this week's gift guide, I've gathered all my favorite green beauty picks for men. I don't know if it's just the men I know, but I've always found it's a whole lot easier to get a guy to try a product specifically marketed at his demographic, so with that in mind, all of these are either products specifically sold for men or, at the very least, are very gender neutral in appearance. Ursa Major makes excellent skincare for either men or women, and both the simplicity of their line and their clean aesthetic and branding make them perfect for men. The Daily Skin Care Set contain everything your man needs for a complete skincare routine: the company's Face Wash (my favorite! ), Face Tonic, and Face Balm, as well as 20 Face Wipes. If you're looking for something a little smaller, the Travel Skin Care Set is another great option. If your guy has yet to switch from conventional deodorant, Schmidt's is absolutely the way to make a convert out of him. It's one of the strongest and most effective natural deodorants out there, but it does have a high baking soda content, so sensitive pits beware. Cedarwood + Juniper is the most typically masculine scent, but there are four other options - including unscented - as well. A lot of companies have started offering beard oils, but what I love about Holiskin's sampler is that it lets your guy try out minis of five different ones. The kit also includes a $10 off coupon he can redeem on the purchase of any full size beard oil, or, maybe amp the gift up even further by switching that out for your own coupon that he can redeem with you for a full size of his favorite. Shea Moisture's men's line has a good range of products and their affordable prices and wide availability make it easy to put together a custom gift set for any man. A number of the products in the line do contain Japanese honeysuckle extract, but the two pictured above, the Three Butters Styling Pomade and Tea Tree After Shave & Bump Preventer, among others, do not. Everyone uses lip balm, am I right? For men, I recommend the Stark & Son Matte Lip Balms from Silk Naturals, which moisturize with a completely matte finish, and the Rebel's Refinery Skull Lip Balms, which are rounded, egg-shaped balms like EOS, but look a little more badass thanks to their skull packaging. Both are sold in a few different flavors. Badger's products are always top notch and the Deluxe Wet Shave Kit is a great gift for the man who's serious about shaving. It includes a high quality shaving brush and artisan-crafted bowl, as well as Badger's Pre-Shave Oil, Shave Soap, and After Shave Face Tonic. Max Green Alchemy products have a light, herbally smell and work great for both men and women. Whether your guy uses hair gel, paste, or pomade, they've got you covered - with multiple options to spare! If you managed to miss Poo Pourri's viral advertising campaign a couple years ago, this somewhat ridiculous product is basically an essential oil spray that gets misted into the toilet before you go number two. The idea is that it creates a film on the surface of the water that traps odors below, so "you can go and no one else ever has to know." Yes, you could absolutely DIY something similar, but the Poo Pourri scent names and overall branding make it such a fun gag gift. What green beauty gifts would you suggest for men? My boyfriend loves the Badger man care! He's on his second bottle of beard oil. Together all of the products have greatly reduced irritation for him (which is so funny to hear him attest to -- beauty blogger style). Thanks Sarah! If you haven't seen them before, definitely check out the Poo Pourri commercials on youtube. It's hard to believe it's a real thing, let alone a crazy successful company! Really great gift guide men are so difficult to buy for so these types of post really help!